Louis knows exactly what gold-digging families like the Sharps are after-his money. But the universally acknowledged truth is that this billionaire needs a wife. Independent Lizzy might not seem the perfect candidate, but her curves are proving powerfully tempting. And the arrogant and well-practiced Louis is sure all it will take to wed-and bed-her is a little seductive persuasion. 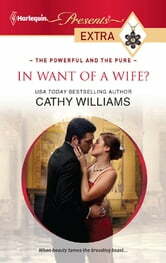 Books related to In Want of a Wife?